This installment of the Deadly Delves-series clocks in at 49 pages, 1 page front cover, 1 page editorial, 3 pages of advertisement, 2 pages of SRD, 1 page back cover, leaving us with 41 pages of content, so let’s take a look! This review was moved up in my reviewing queue as a prioritized review as the request of my patreons. This is a high-level adventure, intended for characters of 16th level, and should bring them to 17th level by its conclusion. This being an adventure-review, the following contains SPOILERS. Potential players should jump ahead to the conclusion. All right, only GMs around? Great! Cout Larom has ordered the excavation of an ancient site, rumored to be the final resting place of the mighty crypt dragon Roanax. This mighty specimen, back when dragon’s ruled the region, was slain in a concerted effort by several of its lesser peers. However, when the magnificent beast was about to draw her last breath, she managed to draw herself, her hoard and her assailants into the eponymous dragon’s dream, endlessly living out her memories, the realities of dream slowly corrupting and changing her would-be slayers. Now, only her skull bears witness to the passage of aeons. The aforementioned excavation did, consequently, not find the mighty dragon’s hoard, merely her skull – and they reactivated its magic. The poor sods were drawn into the mighty dragon’s dream, slain and trapped…or enslaved by the horrid caricatures that Roanax’ foes had become. To complicate matters more, it seems like the dream can capture souls, creating a false afterlife of sorts, which has attracted the attention of a cadre of psychopomps, who fear that the dragon’s dream may well spiral out of control. Sounds awesome, right? While PCs are probably hired by the count to help salvage his archaeological expedition, the stakes may well become much higher…fast. Now, the set-up for the module is actually more detailed than what you’d expect – we get read-aloud text for the count’s estate, as well as some serious notes pertaining legwork that the PCs might undertake to know what they’re getting into. Now, heroes of this caliber don’t grow on trees, and as such, the count is not above mentioning the fabled treasures that ostensibly can be found in Roanax’ hoard. As the PCs approach the singing pit, as the doomed location has become known locally, they will be greeted by further complications: The site has been occupied by a small tribe of stone giants (custom stats included), led by Verot the Godling, a horrid, dominating CR 17 ooze that brought me way back to Book of Beasts: Legendary Foes. And yes, the stats of the monster have been provided as well. When the godling is slain, a warped mass of draconic remnants manifests from its slimy hide, providing a first hint of some truly potent, mutating factors here. It should also be noted that the PCs can obviously meet aforementioned psychopomps and, hopefully, secure their aid: Consulting their meticulously researched material may provide some interesting hints. If the godling is defeated and the PCs are sufficiently charismatic, they may even secure the aif of the powerful outsiders. They’ll need it. Further exploration of the lavishly-mapped pit will yield the remnants of a wasted opera house, where banshees act as singers, and the once proud green dragon Brithorn has been transformed into a forest blight. Corrupting dreams manifest as a specialized haunt that is susceptible to additional forces, and a dybbuk…and ultimately, they’ll reach the skull. Here’s to hoping that they befriended the psychopomps – Rakeshta is stationed here, and she is an olethros, which clocks her in at CR 17. Activating the skull will drag mortals, including native outsiders and outsiders bound to characters, right into the dragon’s dream – and it is there that the PCs will need to go! The dragon’s dream itself is the main dungeon, and it is unique indeed: The complex begins rather regularly, with an orrery that can, when positioned correctly, open a door – failure will result in a battle versus a potent demodand. However, the truly amazing and captivating component of the dungeon would be the dragon’s memories. Throughout the complex, globes of light represent scenes from the dragon’s life, and touching them allows the PCs to live through the experiences of Roanax! Each of the memories has a condition to succeed, and once it is met, the light dims. Failure does allow for retries, provided the PCs in question survive the respective experience. This may not sound like much, but these vignettes are a perfect way to show the PCs the history of the mighty dragon, the trials and tribulations faced, all while they’re making their way past the potent guardians of the complex: Rune giants, mithril golems, jacks-in-iron, nightshade nightwalker with shadow giants…the regular enemies in the dream are no pushovers, with Roanax’ erstwhile vanquishers twisted into a series of exceedingly potent boss-monsters. The dreams themselves, which, while solvable via rollplaying and studded with DCs, are something that many of the more technically-minded high-level modules forget: Excellent venues for creative roleplaying. I can picture many a player chuckling, when, in the skin of a mighty dragon, talking to an elven archmage who claims that he can’t teach more to such a magnificent being. The role-reversal is simply fun. From the banner of legions to mighty Roanax’ spellcrown, the dungeon also offers loot for particularly capable individuals. In particular the mighty staff of sands, focusing on time manipulation and memory tweaking as well as prescience can make for a formidable tool. Soul-trapping statues are just one of the examples where the forces faced require PCs to be up to their A-game. The dreams also contain vital information regarding this place. Ultimately, the PCs will thus progress through ahigh-light reel of the mighty dragon’s life, finally confronting the CR 19 variant old crypt dragon. Here’s the thing: The echo of the mighty dragon draws sustenance from unresolved memories and the fabled treasures she hoarded: Each potent item not claimed will yield her formidable powers; memories not overcome will manifest as shining children – up to 8 of them! If the PCs were sloppy during their exploration, they will probably have no chance to regret their decisions, for the dragon on her own is already a formidable foe! In a smart move, the optional boons granted by the mighty items are not included in the statblock, which means you won’t have to do a ton of reverse-engineering. Good call! Editing and formatting are top-notch, I noticed no significant hiccups in either formal or rules-language categories. Layout adheres to a really nice two-column full-color standard. The artworks deserve special mentioning: The pdf sports a lot of really nice full-color artworks, including a glorious one-page version of the cover art. Aesthetically, there’s nothing to complain here. This also extends to the full color cartography by Justin Andrew Mason, which is excellent and evocative. Better yet, the module comes with an accompanying map-booklet that contains not one, but TWO different player-friendly versions of the maps! One of them sports details like ladders, blood-spatters and grids, while the other is completely barebones. Dear publishers, that’s how good map-support is done! The module does not attempt to account for the vast capabilities of PCVs of this level, but its premise and set-up means that it doesn’t really have to. Once in the dream, the PCs are trapped, but otherwise, we have all the basic covered and enough guidelines to handle this as a proper and well-crafted high-level exploration. In short: This is an excellent module. The craftsmanship and production values are impressive, and the book manages to evoke a unique and concise atmosphere that breathes evocative high fantasy. My final verdict will clock in at 5 stars + seal of approval – Well done indeed, Mr. Winkler! Now available at Paizo.com. This is an amazing 16th level adventure. 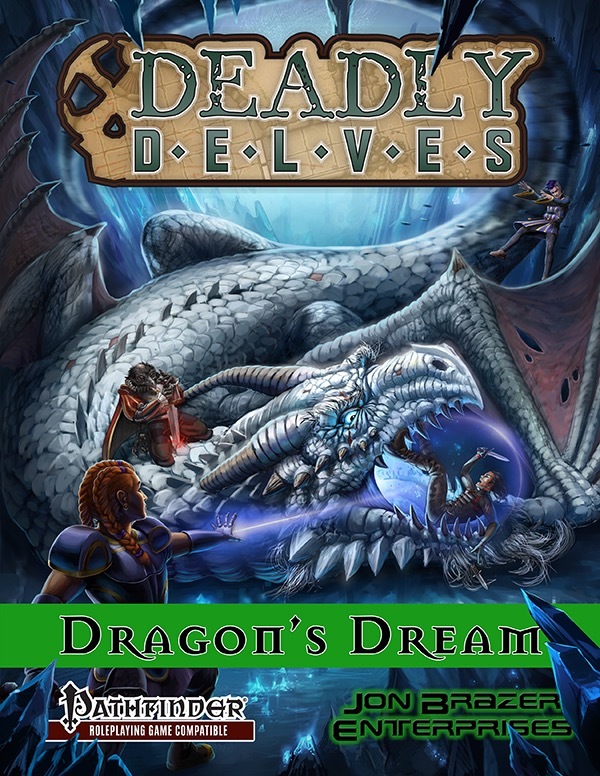 Be sure to check out this adventure as well as all our other Deadly Delve adventures today. Looking to end your Pathfinder campaign in the next year, this adventure is perfect for you. It will help you get there in spades. What is our highest level adventure? Why this one! Such a beautiful cover, isn't it. Download this high-level adventure today. I just wanted to offer what commentary I can at the moment. (Schedule has gone crazy.) Production-quality on this is very high. I'm about half done reading it, but had to pause to crash prep a Strange Aeons campaign plus some real-world stuff. Art is very attractive. Surprisingly so. Story content is good and I actually have intention to slot this in as closure for that Strange Aeons campaign I just mentioned. There's sufficient surreal content that I think it's a convenient fit. I'll try to be more detailed, but it'll probably be a few more weeks before I can complete reading this. In the interim, folks... buy the darned thing. Thank you, Anguish! You made my day. A 5-Star Review + EZG's Seal of Approval. I am glad to see this adventure recognized as being as awesome as I believed it to be. Excellent work on it everyone. Grab it for your game today. This is a really cool adventure! Thank you for taking the time to review. I am glad you liked it so much. We have another high level adventure coming out soon for Pathfinder. Download Dragon's Dream today. Looking for a highly-rated, high-level Pathfinder adventure? This one is well worth checking out. Couldn't have said it better myself. Buy the darn thing. Grab this adventure while it is under $2. It is one hell of a fun adventure for 16th level characters that you shouldn't pass up. Looking for an awesome high level adventure? Check out this adventure. Are you too scared to delve into the mad dreams of a long-dead dragon, still clinging to—let's say life?